region south of 20N, winds will tend to turn Eastwards from Tuesday, 15th. Typical wind direction is aptly shown in the attached IMD wind chart. Hence, in the circumstances, day temperatures are sure to rise. The rise ,as expected by vagaries,region wise, is shown in a map form. An off shore trough forming off the Kerala coast may bring showers to Kerala on Tuesday/Wednessday. In the absence of a rain bearing W.D. the day temperatures are now expected to rise. In the Sindh region, we can now expect 40s in towns like Nawabshah and Sibbi, and Hyderabad. Probably, Nawabshah or another town could manage 42c by Tuesday. Karachi, which as expected touched the 35c mark, will show a sharper rise, with humid conditions, to around 39c on Wednesday.Nights will hover around 22c next 3 nights. In the Northern belt too a rise in day is imminent. Islamabd should now overcome the 25 mark and head towards 30c. Nights will be still pleasant in the capital, not reallly going above 14c. In the absence of any "diverting effect", the winds continue to blow from the NE over the city. And this was expected, as the day temperature at S'Cruz was the predicted 38c on Sunday. However, the observatory at colaba measured 36.5c. And the much talked about variation in Vagaries was really high , with a daynight range of 21 degrees at S'Cruz and 14 degrees at Colaba. As explained , the low humidity of 25% at the minimum helped keep comfort lavels tolerable. Monday: On with the NE winds and the thermometer stubbornly sticks to 37c, but again, nights will be comparitively down at 20/22c as the winds turn NW. And of-course with low humidity levels. Tuesday: Cirrus clouds will streak across, providing a veiled cover, though not thick enough to have any effect on the temperatures. High in the day will be 38/39c and the low will be 21c. Wednesday: Winds tending to veer Eastwards, so a little more rise in the day to 38/39c. Nights going up to 23/24c due to light clouding.No diverting effect seen to change wind directions from the Konkan region. 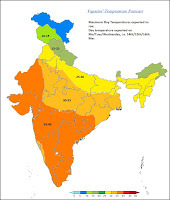 From 18 march onwards maximum temp is expected to drop to 31c in mumbai(santacruz) but not sure about colaba. Sometime you wonder wheather colaba is part of mumbai or not by seeing the difference between weather of colaba and santacruz (eg.26 july 2005) why there is so much difference in weather (esp rain) between these 2 places. today ratnagiri's max was at 39.4 c. wen do u think temperatures r gonna drop,,,along with increase in humidity?